最新研究Grammar school pupils achieve no more than pupils at non-selective schools - 子女教育 - 超级苹果网 - Powered by Discuz! The study also indicates that pupils from a Chinese or Pakistani/Bangladeshi background, make up a larger proportion of grammar school students than they do at other schools. It suggests youngsters at selective schools have a similar level of achievement to their equivalent peers at non-selective schools, once factors such as background, and previous attainment are taken into account. The study, by academics at Durham University, also indicates that pupils from a Chinese or Pakistani/Bangladeshi background, make up a larger proportion of grammar school students than they do at other schools. Researchers used government data on more 549,203 pupils in England in 2015, looking at information on their attainment, school and background. They found grammar schools in England - of which there are around 163 - take around 2% of pupils who are, or have been, eligible for free school meals - a key measure of poverty, compared with 14% nationally. The findings, published in the British Journal of Sociology of Education, also show that on average, grammar school pupils are less likely to have special educational needs, less likely to speak English as an additional language, more likely to be among the older children in their year group, and to live in wealthier areas. 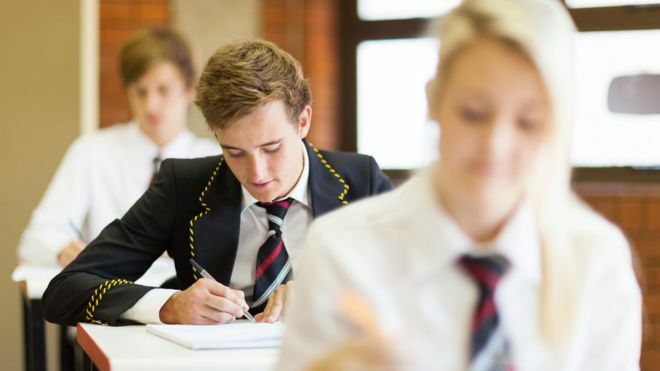 While raw results suggest grammar school pupils get higher average GCSE points scores, once all these factors are taken into consideration, grammar school pupils achieve around the same results as similar students in the rest of the country. It means the apparent GCSE success of grammar schools is down to pupils coming from more advantaged backgrounds and having higher academic achievement at the age of 11, the paper suggests. Professor Stephen Gorard, of Durham's School of Education, said: "The progress made by grammar school students is the same as progress made by equivalent children who do not go to grammar school, on average." He also said: "Dividing children into the most able and the rest from an early age does not appear to lead to better results for either group. "This means that the kind of social segregation experienced by children in selective areas in England, and the damage to social cohesion that ensues, is for no clear gain. "This is not to decry the schools that are currently grammars, or the work of their staff. "However, the findings mean that grammar schools in England endanger social cohesion for no clear improvement in overall results. The policy is a bad one." The results also show that children of a Pakistani/Bangladeshi origin make up 14.7% of grammar school pupils, compared with 8.8% for other schools, while Chinese pupils make up 1.5% of grammar school children, compared with 0.3% for other schools. Three quarters (74.5%) of grammar school pupils are from a white background, compared with 80.5% for other schools, while children from a black background make up 3%, compared with 5% for non-selective schools. Prof Gorard said: "The research itself is silent on why this occurs. "We know, in the same way we know that in general that girls do better than boys, that pupils from Chinese, Pakistani and Bangladeshi backgrounds have higher attainment than some other ethnic groups at school." "These ethnic groups also tend to have different societal and economic backgrounds, and that might explain the differences - meaning that this is not an ethic origin issue as such." Controversial proposals to lift the ban on creating new grammar schools were a key part of the Conservative manifesto in last year's snap general election, but the plans were dropped in the wake of the election result, which saw the Tories lose their overall majority. But grammars can still take on more pupils under rules that allow good state schools to expand. A Department for Education spokesman said: "We want every child to receive a world class education and to give parents greater choice when it comes to picking the school that's right for them - grammar schools are a part of this. "Around 60% of these schools already prioritise admissions for disadvantaged children and we are continuing to work closely with the school sector to widen access further." The spokesman said research has shown that disadvantaged pupils "make better progress across core subjects in selective schools, and attain better results".